Have you had a chance to take a look at the press release from Gigabyte about their Brix products? Just wondering if you may recommend those over the vanilla NUC line? They do look really interesting. I guess it comes down to whether the chipsets will be supported. 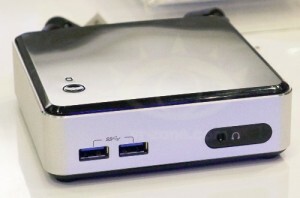 The NUC is based on the Intel QS77 Express chipset and has an Intel 82579V NIC which will work with vSphere. I think the Gigabyte boxes are based on Intel HM77 with CPU options around the Intel Core i3-3227 and Intel Core i7-3537U, but I dont know exactly which NIC they use. One more question for you. Is it the chipsets which limit these boxes to 16GB of RAM? Do you know if the 3rd generation chipsets will allow them to go to 32GB+? It states that the max RAM is 16GB. I’m also interested in doing some VM work on one of these bad boys and would like to pack on as many resources as possible. I think the key here is the DIMMs. As far as I know you cant get 16GB SODIMMs yet, but when they come out and are a reasonable price we may get lucky and they will work. I believe Lambda-tek have them for about £230-ish inc VAT at the moment. They’re not due out for another few days of course! I have bought stuff from them before (including my Synology NAS boxes) so I think they’re pretty reputable. Has anyone else installed on the new i5 NUC? I recently did it. I installed remotely via vPro, using a remote ISO mount (vPro was one of the big things I was looking for). After a few issues with the video, I got further and ran into the NIC issue. I was hoping newer ESXi 5.1 builds would have the driver, but no such luck. I built a custom ESXi image with the e1000 driver, and it works. However, Configuration -> Network Adapters shows that the speed the 82579LM negotiated is “10 Full”. Throughput tests from VM to physical network confirms it’s 10Mbps. Anyone else seeing this behavior? Any newer / better drivers available? After a reboot of the system, it came up at 1000 Full. Looks like the Gen 2 Core i5 is still the best option by far! I just wanted to post and say thank you for your blog. I’ve been looking at how to rebuild my lab as I have old power hungry equipment. Your nanolab sounded perfect for my needs and I had to buy it right away. I already have your cisco switch and synology nas 1513+. Which by the way it’s worth the investment. It’s really fast and can easily expand. I bought 2x Ivy Bridge based NUC’s, 2x crucial 240GB SSD’s (it was on sale at newegg for $140), 16GB RAM, 802.11ac wifi+bluetooth pcie adapter. Plus the USB drives for esxi and power adapter’s. On vPro – Any thoughts on how to manage vPro with SCS or do you use something else? Do you know of any apps for iPhone? I have VPN setup on my iphone and it would be cool to be able to manage my nucs via my iphone. I bought 2 NUC’s, 2x crucial 240GB SSD’s (it was on sale at newegg), 16GB RAM, 802.11ac wifi+bluetooth pcie adapter. Plus the USB drives and power adapter’s. I plan to use it to study vmware, server 2012R2, windows 8.1, windows 2008r2 (the version we use at work), and other things as I run into it. I’m pretty excited thanks for the idea! Hi Jeff, thanks for the feedback! Sounds like you have an awesome setup there! I dont own the vPro version (yet) so cant comment on that just now. I plan to get one in the next couple of months though as I really want a 3rd node. can i add an extra nic (USB) to have 2 nics? which model would be compatible. I am thinking about getting the newer models that support the haswell processors. Hey Alex, any further word on whether or not a 2nd NIC will work in the NUC units? Any update on tests with 2nd NIC in the NUC? I have just installed ESXi 5.1 with 2 Intel i5 NUCs, running nicely, but would like to test dual nic. I saw one blog with the mini nic adapter hanging out the back of the NUC, its an option but…..